A distinguished Jury last month chose a handful of prizewinners from a shortlist of 19 projects selected as finalists in the inaugural GLOBAL+5 competition. The first ever festival of global governance, GLOBAL+5 was conceived by The Global Journal to identify and draw attention to concrete ideas and projects focused on addressing the most pressing challenges at a global level over the next five years. 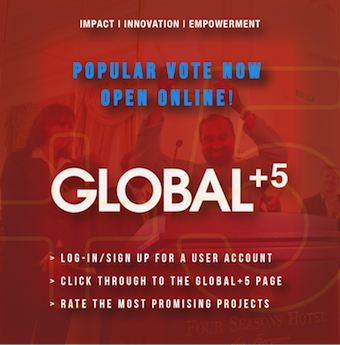 The Global Journal now invites the general public to look into these projects and cast a vote for the projects that seem most relevant and promising to each of you, no matter in which part of the world you live. Which projects do you think could have the greatest ability to empower and engage citizens? Which present innovative solutions promising the most impact? Each of the projects featured at GLOBAL+5 has the power to stimulate innovation and contribute to our collective attempts to address the most pressing global challenges in the next five years. Thank you for your becoming a part of the solution and happy voting!